There were more than a dozen major battles in Italy, and Bessieres was in the center of the fighting of the most important of these. The Italian campaigns, as they are known, brought Bessieres to the attention of General Bonaparte. Murat, Bessieres’ old friend, is the one who pointed out the cavalry captain to the General. The battles of the Italian campaign have now been relegated to the history books, but in 1796 and 1797, they were instrumental in defeating the Austrians: Montenotte, Millesimo, Dego, Mondovi, Lodi, Castiglione, Roverto, Bassano, Arcole, and Rivoli. The battles of Lonato, Castiglione, Rovereto, Rivoli, and la Favorita di Mantovia would prove fateful for the future of France, and General Bonaparte, these were the battles at which Bessieres’ uncommon valor, calm in the heat of battle, and clearness of thought under pressure were noted by the General. On 4 Jun 1796, because of his courage and abilities, Bonaparte created the Guides and made Bessieres their commander. The Guides was the unit that Napoleon would use as the foundation to build his famous Imperial Guard. At the battles of Lanato and Castiglione (4 August 1796) he was, as he remained throughout his life, at the center of the most heated fighting; he had the unusual ability to accurately assess any situation without the biases of hope, fear, and ego. Whether standing on the ground or sitting tall in the saddle, Bessieres could always be seen leading the fighting or directing it, as if he were standing in his own parlor directing furniture movers. Swords, bullets and balls (cannonballs) all around and yet it was as if Bessieres had not noticed. At the battle of Rovereto he broke through the center of the Austrian line, capturing two enemy guns and turning them on the enemy. After the battle of Rovereto he received a battlefield promotion to major for courage under fire (4 Sept 1796). At the first battle of Rivoli he led an ambush that surprised the Austrians and was the deciding point of the battle. At the second battle of Rivoli (14 Jan 1797) he again distinguished himself for courage under fire and clearness of thought while all about him chaos reigned. 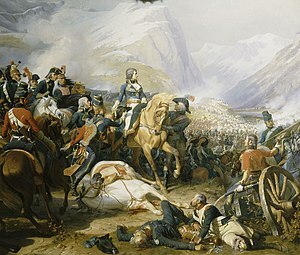 At the siege of Mantua, Bonaparte began an offensive to defeat the Austrians coming to the relief of Mantua. The left and center of the Austrian line crumpled under the assault. The most contested fighting was in front of the Palace la Favorita di Mantovia (16 Jan 1797) on the right. In the center of this action, you guessed it, there was Bessieres; like George Washington twenty years before, he moved as if he wore an invisible armor that made him immune from harm and invincible. Eventually, the Austrians were driven from the field in full retreat. 21 Jan 1797 Napoleon ordered Bessieres be sent back with captured flags and the letter above. On 24 Jan 1797 he departed Verona (western Venetia) to the Executive Directory with the captured Habsburg regimental flags, returning to Paris as the honored conquering hero. On 4 Mar, Bessieres was promoted to squad leader, and on 9 Mar, the Guides were enlarged to also include infantry and artillery; and Bessieres received his second promotion in less than a week to full colonel and brigade commander. More important, as a sign of his growing respect for Bessieres, Bonaparte appointed the new colonel as tutor and instructor to Bonaparte’s stepson Eugene. The next campaign would take Bessieres to the East and Egypt with Bonaparte. When the two men returned to France the next time, it was to install Bonaparte as France’s new ruler, and Bessieres as a Marshall of France. When the old title of Marshall of France was revived, Bessieres would be on the first list of those promoted to the honor; he would also be Napoleon’s best friend and most trusted advisor, the man Napoleon turned to for advice in his darkest hours. Napoleon Bonaparte had plans for returning stability to France, regaining France’s lost territory, and marrying Jean Baptiste Bessieres to his sister Carolyn Bonaparte. However, as always, Bessieres would prove to be his own man, loyal to his country, but still in control of his own destiny. hours ago, which of course it wasn't.